I'll have swatches of the new Picture Polish shades up very soon, but in the mean time, I thought I would share a quick mani of how I wore the first of the new release collaboration shades. I chose to put Eerie by Very Emily on first. Emily is a blogger from Belgium, a beautiful country that I have visited twice, and I've admired Emily's fabulous photography and nails for quite a while. You can read about Emily's inspiration for her shade here. I'll provide a fully review of Eerie when I have my swatch posts, so this is just a quick how I wore it post. I paired up Eerie with a very shiny holographic glitter called Milky Way from Aussie indie brand Kester Black. I added some glitter tips and Swarovski crystals. Unfortunately it was pouring with rain the day I wore this, so these are some less than stellar indoor shots in my kitchen, but they do show up how bright and shiny the holo glitter is. 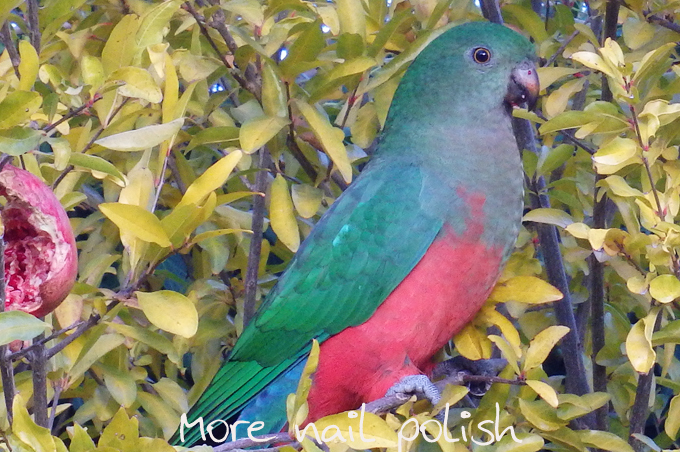 I also wanted to share these photos of this gorgeous pair of Australia King Parrots that I spotted in the back yard on the weekend. 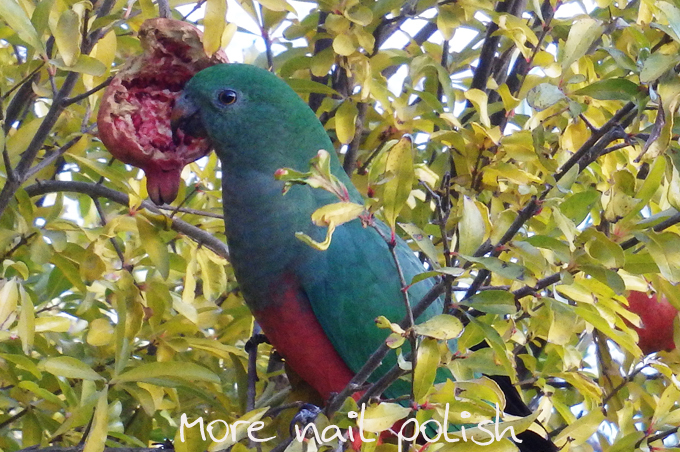 Both Mr and Mrs King Parrot stopped by for a visit and to eat up the split pomegranates still left of the tree. First is Mr Parrot, with his bright red head and body and his rich green wings. And here is Mrs Parrot, who is the reverse colouring of her partner, with a green head and wings and a red underbelly. Nom nom on the pomegranate. 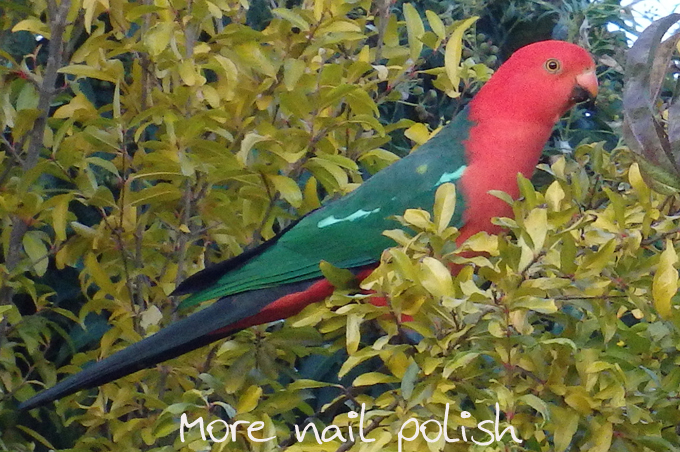 Aren't we so lucky to have such beautiful native birds come visit us in our back yards in Australia! That is a beautiful pair. Sty the moment we seem to have so many cockatoos and gallahs around. Kind of strange for winter time.